A: The QuickBooks ProAdvisor Program enables accounting pros to grow their firm, skills and QuickBooks® expertise by providing benefits, including training, customer care, strategic marketing tools and accountant specific product discounts. Click here to learn more about the ProAdvisor Program. A: The QuickBooks ProAdvisor Program is available to all accounting pros using QuickBooks Online Accountant. When you create a QuickBooks Online Accountant login, you’ll belong under a QuickBooks Accountant (QBA) firm and you will automatically be enrolled under the QBA firm’s ProAdvisor Program account. Each QBA firm has its own ProAdvisor Program account. Q: When will the new points structure, tiers and benefits of the program be live? A: We’re hard at work getting everything finalized. We’ll notify you via email, on our blog and in QuickBooks Online Accountant when the redesigned program is live. Until then, check out the new Intuit® Marketing Hub, available today! Q: How can I access the new benefits? 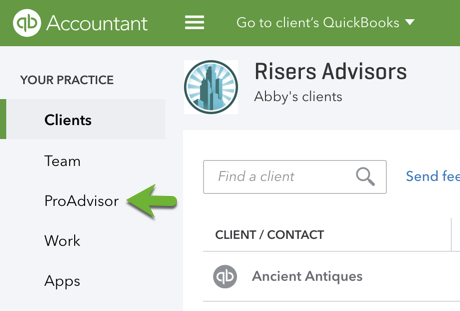 A: Once the redesigned program is live, you’ll be able to access the new benefits from the ProAdvisor tab on the left-hand side of QuickBooks Online Accountant while logged in. All existing benefits of the program can still be accessed in the ProAdvisor tab. Q: Will this redesigned ProAdvisor Program impact my current benefits and listing on Find-a-ProAdvisor? A: No, you won’t lose any of your existing benefits you currently have once the redesigned ProAdvisor Program is live. Also, your listing on Find-a-ProAdvisor will not be influenced by the new program changes. As long as you still have an active certification, you can publish your profile on Find-a-ProAdvisor.